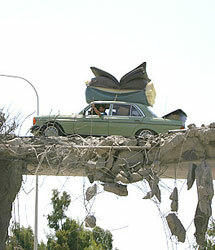 August 14, 2006 | A motorist braves a bombed-out bridge in Damour, Lebanon. Displaced residents are heading home by the thousands despite Israel's declared travel ban. Israel meant to break Hezbollah with its month-long offensive, but instead the militant organization has been strengthened politically in Lebanon.